Once in a while, I just want a really good salad. This chopped chicken salad combines some of my favorite salad ingredients. I’m a sucker for a combination of fruits and veggies when I make a salad. I think it’s that touch of sweetness I crave from the fruit that gets my wheels turning. From blueberries and strawberries to cabbage and cucumber, this salad has it all. It’s topped with a homemade cashew butter honey mustard that may just be the simplest salad dressing you will ever make. The sky is the limit with chopped salads. You can put just about anything you like in them which makes them one of the most versatile recipes on the planet. I like to throw whatever is left over in the fridge (and on the verge of going bad) in my chopped salads. It’s a great way to use up leftovers. It’s also a quick and simple dinner solution on busy weeknights. We paired this salad with a great Double Rye IPA, so read ahead for more! Description: This Belgian-Style Double Rye IPA is spectacular. I wanted something on the hoppy side for this food pairing. This ale is hoppy, but it is also so much more than that. With malty notes and citrusy aromas, this beer is the perfect pairing for a light and refreshing salad. It also has just a touch of sweetness that you crave with a hoppier brew. It’s one of a kind and a great double rye IPA all around. I highly recommend giving it a go if you haven’t yet! It won’t last long, as it is limited. Act quickly before it’s too late! Chopped Chicken Salad is loaded with fruits and veggies. It''s topped with a light and refreshing cashew honey mustard dressing! In a large saute pan, heat the olive oil over medium heat. Add the chicken breast and season with salt, pepper, chili powder, garlic powder and cumin. Cook until brown and cooked through, about 8-10 minutes. Remove from heat and set aside to cool. Prepare your fruits and veggies while you wait for the chicken to cool. Toss the chicken with the spinach, strawberries, blueberries, carrots, cucumber, garbanzo beans, grape tomatoes, red cabbage, goat cheese and toasted almonds. Set aside. To prepare the dressing, combine the cashew butter, oil, coconut water, mustard, honey, garlic powder, cayenne and salt in the bowl of a food processor. Pulse until the ingredients are smooth. Serve the salad with the cashew butter honey mustard and enjoy! This salad is putting my lunch to shame! It looks bright, healthy and super tasty. I was just hoping that it would be “detoxifying” enough for you, Nora! 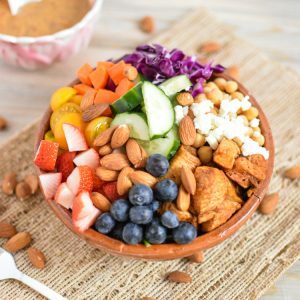 I saw this salad all over Pinterest and had to check it out! I was beyond excited to see it was yours :). It looks absolutely beautiful and it’s just what I need to get me through yet another snow storm!